The Pilgrims Rest - Bed And Breakfast Bed And Breakfast High Street, Littlebourne CT3 1ST. 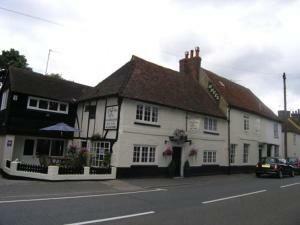 The Pilgrims Rest - Bed And Breakfast, High Street, Littlebourne CT3 1ST. The Pilgrims Rest is a sympathetically renovated, Grade II listed, late 16th-early 17th century building, now housing a bar and lounge area, a dining room and 6 en suite bedrooms. The Pilgrims rest has a rich and fascinating history. In the early 19th century, the building was home to a farrier, whose forge stood next door. As recently as the early 1900s, part of the building was a butcher's. Today, the property has been carefully restored and sensitively refurbished by your hosts, Gerard and Denise McNicholas. There are now 6 en suite rooms with all the comforts the modern traveller requires, including tea/coffee making facilities and flat-screen TVs with Freeview digital channels. Each room also has a work desk and ironing facilities. The Pilgrims Rest has a bar and lounge area and a dining room where breakfast is served or where an evening meal can be enjoyed. Free wireless internet is available in public areas. In the centre of Littlebourne, on the A257 main road, only 4 miles (6.5 km) south of Canterbury, the Pilgrims Rest makes a good base, whatever your reason for visiting the area. Free private parking is possible on site. Hotels in Littlebourne: The Pilgrims Rest - Bed And Breakfast, High Street, Littlebourne CT3 1ST.